When you’re running late for work or a meeting and only have a few minutes of time to consider a new piece of content for your blog or website, you may feel completely overwhelmed. 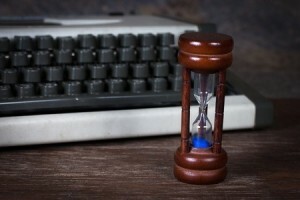 With no time today, no time tomorrow and no time anywhere in the near future, it can be hard to set aside any sliver of time in which plans for new content can be considered and executed. Fortunately, conventional wisdom about what it takes to create great content can be thrown out the window – in today’s day and age, you only need a few minutes to create great content when following some simple guidelines. Below, we’ll talk about some quick ways to create content when you would otherwise think that you don’t have the time to do so. Even with short pieces of content, you’ll want to be sure that you’re targeting keywords and pinging links appropriately. Whether your content is 1,000 words or 200 words, you can focus on SEO keyword topics all the same. If you’ve already done your homework and have a variety of topics and keywords on hand, then this part of content creation should be almost automatic in nature. Rather than fumbling through a long, drawn-out series of paragraphs that can take loads of time to create, go for making lists. When you focus on creating a “top five” or “top ten” list, you can quickly and adequately address a variety of interests or points for your readers and not be tied down into writing hundreds of words on each subject. This will streamline the process and make content creation in these trying times much quicker. When you try to address multiple issues as a part of a broader topic in one sitting, you’re never going to be able to create content in a matter of minutes! By taking a very isolated and niche subject to write about instead, you’ll be able to start creating content and pinging links quickly. It’ll surprise you how quickly you can craft a blog post or article when limiting your focus! There are multiple forms of content out there that provide great value – why not summarize and link to one of them as a way to quickly create content? Whether it be an infographic, a study or survey, or a webinar transcript, you can quickly provide a basic summary of the content in your own words while providing your readers with valuable insight and information at the same time. Google’s algorithms as of late value the quality of the content more than the quantity; we have seen even small posts and pages do well in search because those pages and posts provide readers with value. Using bullet points to succinctly provide information will not only make things easier to describe on your end, but it will also make it easy for the reader to absorb. A win-win! Basic formatting tricks like this can go a long way in making it easier for readers to digest information (and easier for you to get by with less).